The Eagles added to their wide receiver depth chart on Wednesday, as they signed veteran pass catcher Kamar Aiken to a one-year deal. This comes a day after the birds cut ties with wide receiver Marquess Wilson. Kamar Aiken has played in the NFL for 6 seasons on 4 different teams. His best season came in 2015 with the Ravens, where he put up some solid numbers. Aiken had 944 yards on 75 catches with 5 TDs. Aiken’s game has fallen off drastically since, as he’s only started a combined 13 games since with the Ravens and last year with the Colts. Kamar Aiken will join an already crowded group of Eagles receivers. The top 4 receiver spots seem to be already set barring injury, as Alshon Jeffery, Nelson Agholor, Mike Wallace and Mack Hollins will hold down those positions. Kamar Aiken will compete for the 5th or 6th receiver spot, where there will be tons of competition. With the likes of Shelton Gibson, Bryce Treggs, Greg Ward, Rashard Davis and veteran Marcus Wheaton, the battle for the last two receiver spots should be interesting. 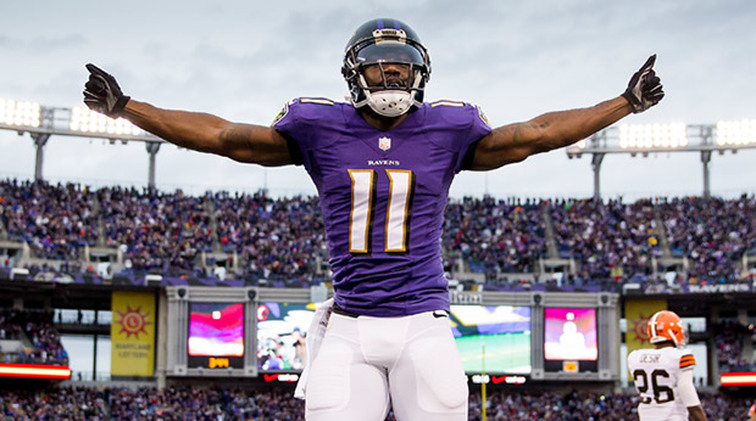 If Kamar Aiken can contribute anything this season for the birds, the signing will be a win for the franchise.